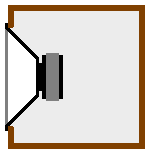 An acoustic suspension is a type of speaker enclosure in which a loudspeaker is mounted in a cabinet with a closed back and no ports or vents. Acoustic suspension (air suspension or sealed box) is a type of loudspeaker speaker enclosure design which uses one or more loudspeaker drivers mounted in a sealed box or cabinet. Acoustic suspension systems reduce bass distortion that can be caused by stiff motor suspensions in conventional loudspeakers. It was invented in 1954 by Edgar Villchur, and brought to commercial production by Villchur and Henry Kloss with the founding of Acoustic Research in Cambridge, Massachusetts Speaker cabinets with acoustic suspension can provide tight and accurate bass response, especially in comparison with an equivalently-sized speaker enclosure which has a bass reflex port or vent; the bass vent boosts low-end output, but at the tradeoff of introducing phase delay and accuracy problems. Sealed boxes are generally less efficient than a ported cabinet, so a sealed box speaker cabinet will need more power amplifier wattage to deliver the same amount of bass output. While boxed hi-fi speakers are often described as being acoustic suspension, or ported (bass reflex) depending on the absence or presence of a port tube/vent, it is also true that in typical box speakers with more than two drivers, the drivers between the woofer and tweeter are usually designed as acoustic suspension, with a separate, sealed air-space, even if the woofer itself is not. One notable exception to this was the Sonus Faber Stradivari Homage which uses a ported enclosure for the midrange. The two most common types of speaker enclosure are acoustic suspension (sometimes called pneumatic suspension) and bass reflex, so they are worth comparing. In both cases, the tuning affects the lower end of the driver's response but above a certain frequency, the driver itself becomes the dominant factor and the size of the enclosure and ports (if any) become irrelevant. In general, acoustic suspension systems (driver + enclosure) have a second order acoustic (12 dB/octave) roll-off below the -3 dB point. Bass reflex designs have a fourth order acoustic roll-off (24 dB/octave). Given a driver which is suitable for either type of enclosure the ideal bass reflex cabinet will be larger, have a lower -3 dB point, but equal voltage sensitivity in the pass band. WinISD comparison of a FaitalPRO 5FE120 in a sealed (yellow) and ported (cyan) cabinet. The ported enclosure demonstrates increased bass output in the 50 Hz range. This is a simulation of a typical 5" mid-woofer, the FaitalPRO 5FE120 mid-woofer generated by WinISD. in ideal sealed (yellow) and ported (cyan) configurations. The ported version adds an octave of bass extension dropping the -3 dB point from 100 Hz to 50 Hz but the tradeoff is the cabinet size is more than twice as large, 8 litres of interior space vs. 3.8 litres. It is also worth noting that above 200 Hz the simulations converge and there is no difference. Thus a ported cabinet does not provide improved bass output over the entire sub-bass range. 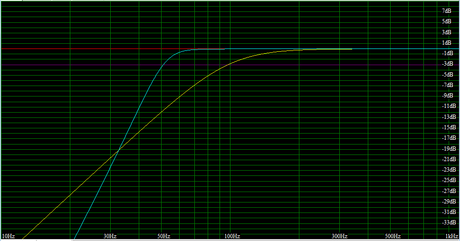 The idea that a ported enclosure would be more efficient (improved voltage sensitivity) is a popular myth. The acoustic roll-off of acoustic suspension designs makes them easier to integrate with other drivers with a crossover (passive or active). This makes it an ideal choice for midrange enclosures as well as for satellite speaker and subwoofer systems. The acoustic-suspension woofer uses the elastic cushion of air within a sealed enclosure to provide the restoring force for the woofer diaphragm. The cushion of air acts like a spring or rubber band. Because the air in the cabinet serves to control the woofer's excursion, the physical stiffness of the driver can be reduced. Unlike the stiff physical suspension built into the driver of conventional speakers, the trapped air inside the sealed-loudspeaker enclosure provides a more linear restoring force for the woofer's diaphragm, enabling it to oscillate a greater distance (excursion) in a linear fashion. This is a requirement for clean and loud reproduction of deep bass by drivers with relatively small cones. Even though acoustic suspension cabinets are often called "sealed box" designs, they are not entirely airtight. A small amount of airflow must be allowed so the speaker can adjust to changes in atmospheric pressure. A semi-porous cone surround allows enough airflow for this purpose. Most Acoustic Research designs used a PVA sealer on the foam surrounds to enable a longer component life and enhance performance. The venting was via the cloth spider and cloth dust caps, not so much through the surround. Acoustic suspension woofers remain popular in hi-fi systems due to their low distortion and small cabinet volume required. They also have low group delay in the bottom end compared to bass reflex designs but the audibility of this benefit is hotly contested. In the 2010s, most subwoofers, bass amplifier cabinets and sound reinforcement system speaker cabinets use bass reflex ports, rather than a sealed box design, in order to obtain more extended low-frequency response and get more SPL. The speaker enclosure designers and their customers view the risk of increased distortion and phase delay as an acceptable price to pay for increased bass output and higher SPL. That said, if one is designing a sound system for a style of music where very accurate, precise bass rhythms are an important part of the genre, one may wish to consider the merits of sealed box woofers and subwoofers. ^ * "Edgar Villchur and the Acoustic Suspension Loudspeaker". Audio Engineering Society. Retrieved 2015-01-20. This page was last edited on 30 September 2018, at 01:22 (UTC).